Join our very affordable program in a country with stunning landscapes, pristine beaches, captivating cultural heritage and unique experiences within a compact location. Situated on the tip of India, Sri Lanka is a small island and is ranked as one of the best volunteer abroad destinations. This is in large part due to the warm and welcoming people who will always appreciate the volunteer work you will do. 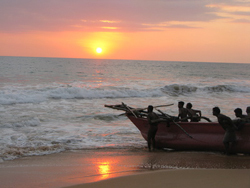 Sri Lanka paid a heavy price in the Tsunami of 2004, which devastated life and property. The country suffered even more during the civil war which concluded recently after 33 years. With the peace returning, the people are now optimistic that Sri Lanka will march towards economic prosperity and the lives of the people will become better. They see tourism and volunteers like you as a great help in developing the country. RCDP works with grassroots projects in Sri Lanka to help the disadvantaged. Each year, we send many volunteers to empower the deprived by helping them acquire skills necessary to thrive. Our volunteers will work with local people, immerse in local culture, enjoy the landscape and return home with life changing experience. Join our volunteer project in Sri Lanka now and be part of this amazing journey. 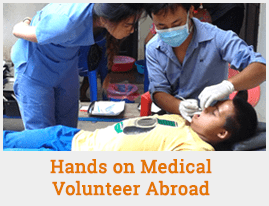 You can choose from such volunteer projects like orphanage work, teaching English, teaching Buddhist monks, elephant conservation and language and cultural program. RCDP Sri Lanka volunteer Program starts every 2nd and 4th Mondays of each month. Every year hundreds of volunteers arrive in Sri Lanka to volunteer from UK and USA based organizations and end up paying up to $2500 to volunteer for 2 weeks. Unfortunately, only a small portion of that money actually goes to host projects and host families. The local host projects (orphanages, school, and local NGOs) in Sri Lanka are poor and need external support to run their programs. In our program, you will pay your fee directly to host families and projects up on arrival in Sri Lanka.When you join our program, we will make sure that all of your money goes to the projects and host families. Part of your fees also helps us to cover our expenses. The program fee is divided in as registration fee ($279) and weekly fee ($80 per week for room, food, coordination, and project donation). Galle is expensive tourist city of Sri Lanka. In Sri Lanka, weekly fee is divided between room/3 local foods a day (80%) and project donation/support of local project staffs (20%). This allocation may be different depending up on location, project type etc. However, our coordinator will explain these issues before you pay the fee. Please find below the break down of cost in a weekly basis. RCDP is responsible for looking after the accommodation and meal of the volunteer during your program in Sri Lanka. Volunteers will stay with a host family in all the projects except in an onsite accommodation (hostel) in elephant conservation program in Kegalle. 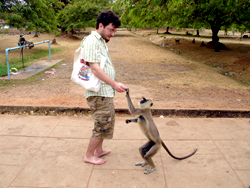 Our host families in Sri Lanka are well screened and they are socially respected. The family will offer you a safe and secure place to stay. Staying with a host family is a wonderful way to immersion in a local culture. In the host family, you will enjoy 3 local meals a day with the family. Sri Lanka meals are spicy and delicious. They love deep friend snacks while fish and coconut are two very popular items in their food. A typical Sri Lanka dinner or lunch may contain rice and curry, while flat bread is also popular. In the host family, you will have a room for yourself or share it with other volunteers. The hostel in the Elephant Conservation project is located inside the project and is built to accommodate volunteers. The hostel overlooks paddy fields and is surrounded by palm trees and has en-suit bathrooms, basic kitchen with sink, kettle, fridge, washing machine and a lounge area with a library. While in the project, volunteers will also be provided 3 local meals in a restaurant opposite of the project. The food will be fresh and nutritious. While in the project, our staffs will also regular call on you to see if you are facing any problems and we will try to tackle it immediately.